Oh, you guys, I am such a terrible guest blogger! Well, I'm not great at keeping up with my own blog either, in all honesty. 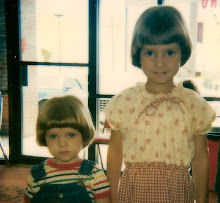 Though really, I had high hopes and grand plans for this maxi dress project. My last post (oh, so long ago! but so many good ideas.) alluded to the time issues we all face, but I ran into another issue, namely what to do when you actually find the time to work. You clear a Saturday, you brew coffee and start working bright and early, you spend six hours sewing, and at the end... this. That right there is my muslin. Well, my first muslin. I'll definitely have to make another one. I thought I got everything right when I altered the pattern (though in all honesty I had a feeling that the fit was a bit off), but as you see, once I put the two sections together to pin, my side seams ended up off by about 2 inches. Oh, ladies and gents (I insist on maintaining the belief that there are men out there reading sewing blogs! ), what a feeling of crushing defeat. Though really, maybe crushing is not the right word. I was incredibly frustrated that I'd spent an entire day making a muslin that ended up being complete crap, I realized right away that not only had I ruined sale-price muslin (so maybe $2 a yard?) rather than my lovely amazing fabric, I also learned so, so much. I'll start with the alterations I mentioned. First lesson, tracing paper is great for sewing patterns. Since I was altering a commercial pattern for the first time, I traced the pattern (markings and all) onto tracing paper, cut out those pieces, and did my alterations on the tracing-paper copies. Possibly overkill if my alterations had been correct, but since they weren't, I still have pristine versions of the real pattern pieces. Second, alterations are hard! 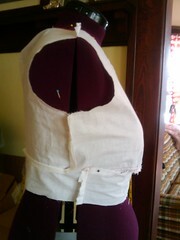 For my (failed) muslin, I did a full-bust alteration, and I added about an inch of width to the midriff piece. Wait, actually, I added an inch to the front piece; for some reason, I decided not to add any width to the back. One of the things that I figured out was that you really do need to make sure that you're adding/subtracting the same amount everywhere. I don't know why I didn't believe it when I read it at least eight times during the alteration-planning, but learn from my mistake, and alter carefully and evenly. Third, it really is worth the time to have someone else help you with measurements. I have not actually done this yet, but once my oh-so-carefully measured bodice muslin did not fit at all, I finally admitted that 'mostly accurate' will not cut it when sewing garments, especially with anything more complicated than an A-line skirt. Fourth, it's probably worth it to do a fully-lined muslin of the bodice. Or of any similar garments that are lined. Once I saw my poor mismatched seams, I realized that my decision to do a modified muslin with an unlined bodice was a bit doomed anyway, as the fit wasn't going to be the same, what with sewing extra seams and all. Oh goodness, there are probably more lessons, but I am afraid I'm not even making sense anymore. My students have a midterm next week, so I spent this week's classes reviewing material, and at the end of so many explanations, I had this sinking suspicion that I'd just confused them more. I guess what I will say is that Kelli's post was quite a comfort to me. I wanted so badly for this project to go well, so I'd have super useful and hilarious blog posts for you all, but everything just seemed to go wrong. School was just ridiculous, I was all thumbs whenever I did have time to sew, and oh, seriously, that muslin failure is going to be bothering me for months. And to top it all off, I had to go away last weekend for my grandma's burial. I talked a little bit about her here. She died almost two years ago, but for a few different reasons, we weren't all able to make it up north to the family cemetery until now. Before I left, I was so confident that I was done grieving that I brought tracing paper & a measuring tape so I could enlist my mom's help in having another go at the pattern. I was quite wrong. I hate to bring that up here, as this lovely blog is such a happy place, but one thing that I realized is that sewing keeps me connected to Grandma every single day. And I think what's really amazing is that sewing serves that purpose for so many people, of keeping them connected to family and tradition and a wider community of sewers. Kelli & Rian, our lovely and oh-so-patient hosts, are proof of that. I can think of so many of my crafty friends that learned how to sew (or knit, or crochet, or whatever) from their mom or grandma. Sewing is one of those things that holds us all together; it's a vehicle for passing down not just sewing technique, but family traditions, and it something that connects each individual sewer to a wider crafty community. And I will stop here before I cross over from sincere to maudlin. I will just say, this will be my last post of the Maxi Dress sew-along, though I will likely update you when (not if!) I finally finish my dress. I have enjoyed it so much, and this has been such a great introduction to this whole group blog, sew-along thing. Presserfoot is such a cool space, and I'm psyched to be a part of it. Real life is a part of sewing, probably the hardest part. Having all the side seams match up is nice, but with your fabric it might not be noticeable either way. It was great to have you along last month and I look forward to seeing the finished product! Your writing about your grandmother was lovely, by the way. A truly honorable thing to say about someone you love, and it's true that sewing can be so much more than the stitching and cutting. There's a magic there, and such a connection to memory -- especially when you've learned from a loved one. Good luck on your dress, you'll do fine.